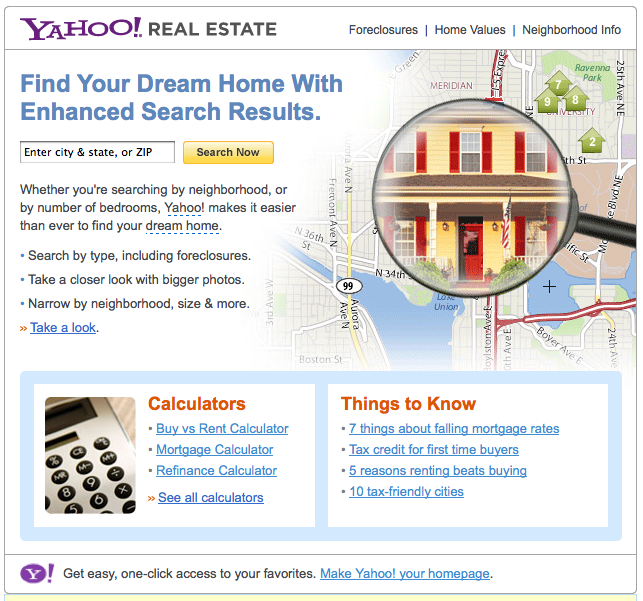 Yahoo Real Estate? – The Jury Is OUT! I’m looking for a “Verdict” on this one, and need your help. I’m just curious what your thoughts are about the idea of Yahoo trying to capture the “Buyer” market? Just because they have the presence, power, money and ability to do this on the web, does this mean they should? I was spammed to boot. Don’t get me wrong, I believe in equal opportunity, just wondering how this might affect those who are using their tools and paying for some of their services only to have them trying to take the very business you’re after away. I’m a big fan of the many Yahoo tools and services, but this one, I’m not too sure about. The jury is still out on this one, will you be the Jury?? What are your thoughts and wonders….I’m parked! « REALTORS® – Important 100K Announcement!